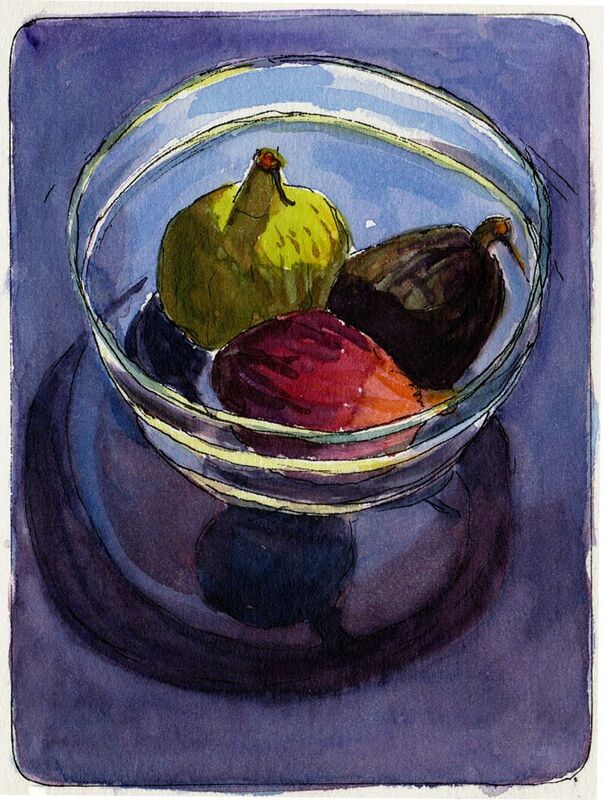 Figs in glass bowl in sun, ink & watercolor, 7x5"
After a summer of fighting with a contractor to properly complete my backyard deck and some other construction (beginning stages of garage to studio conversion), the work is done and I can finally enjoy painting on my backyard deck. This was my first happy little backyard sketch of three varieties of organic figs. I painted sitting on my cute new wicker love seat, bought for just $20 from neighbors who were moving away. I may at some point share my lengthy rant about the way many contractors condescend, ignore, cheat and/or bully women clients, but it’s too nice a day to dwell on such things. I’ll just say that after talking to other women who’ve managed their own construction projects with male contractors, the problem is all to common. But now the sun is shining, the wind and fog have disappeared and I have a little bouquet of roses waiting to be painted so I’m heading out to the deck! Beautiful colors, Jana! Do you purposely brighten things up a bit? Sorry to wreck your statistics about women working with contractors, but it happens to men too. I think the common denominator is contractors. My hubby and I always look at each other, sigh, and say, “Contractors are pigs.” Any job we’ve ever had done, he has to follow around and clean up after. I have to follow around and say, “NO, we agreed on THIS, not THAT! !” Sigh. Well this contractor was fairly tidy, so not a pig in that sense, but he made all kinds of last minute bad decisions because of poor planning, without consulting me, or bullied me into accepting the problematic solution to the problem he created (if he consulted me at all), and then taking months to do what should have been a week or two job. I learned so much in the process! I did have to do that “we agreed to this, not that” a couple of times when he took unacceptable shortcuts because I was aparently too nice so he assumed he could get away with things. I’m sorry you had a rough time with yours too, but the reminder is good that it’s not just women clients, it’s the contractors. My theory is that they’re often guys who can’t hold a job working for others so they start their own business where they can work when they want. On the other hand, my sister and her husband are contractors with a design/build company and they’re wonderful…just the opposite of this fool. I should have hired them except that brings up all the issues of working with family which can be risky too. Re the painting, I don’t think I brightened things more than how I saw them. The sun was really strong so the shadows were too, and the colors were pretty bright…but maybe I pushed them just a little. SO perfect, this little painting, Jana! I love figs and I love your painted ones! How exciting that you have a new deck and are converting your garage to a studio. What will you do with your current studio? A always, love the painting. Hi Lea, I’m not sure yet. I’m still firmly ensconced in my current studio, and won’t move out there until after I leave my day job in a year to 18 months. Then I’ll decide whether to keep the whole duplex and continue using the back unit for studio and teaching, or rent the back unit for extra income and use the garage as my studio for painting and teaching. But now the garage has a french door to the deck and electricity so it’s handy for projects and storage. It still needs insulation and sheet rocking but I’m so fed up with contractors I’ll probably wait until next spring for that. It’s like this was made for me! I love this Jana – it jumped off my reader, and I had to have a closer look. Sorry your contractor experience didn’t go well – they almost never take women seriously here in France either. Claire is back in SF job-hunting. It looks like I will have an excuse to go back and visit you. Wonderful figs!!! They are my new favorite fruit and this painting is a treat! So glad to hear you’re maximizing the positives (the new deck and beginning on the garage studio). Too bad there isn’t a better business bureau for building trades! I’m looking forward to more new deck paintings. Exciting that you have a planned in to your day job…is that retirement or a planned switch to making art your primary source of income? Lovely, rich colors. I’ll be sad when all the gorgeous summer fruit is gone from the local farmers markets. They’re such a pleasure to paint. Glad to hear that you successfully survived a construction project! And it’s a wonderful drawing that you’ve provided to celebrate the success!